Michelle and Eric lent their expertise in the live video “Why Early Detection of Dementia is Important” to speak about the importance of detecting Alzheimer’s disease in its early stages. When a progressive disease like Alzheimer’s is detected in its early stages, preventative measures, treatments and lifestyle changes can be applied to effectively slow the disease. Though there is no cure for Alzheimer’s, doctors and scientists have made great strides in its treatment. Early detection allows for more effective treatment options. A complete and thorough evaluation for the dementia is 92% accurate, so it’s worth taking the time to get checked. The brain is the command center for our bodies. Yet testing for dementia is rarely performed. Now that science has a better understanding of how the brain works, there are fewer stigmas around cognition than in the past. We, as a culture, are beginning to understand that we need to actively care for our “command center” and its functioning. Family members who are noticing a decline in a loved one’s cognition and functionality should have a conversation about getting checked for dementia. Catching a cognitive disease in its early stages can help a loved one live a happier, more fulfilling life. 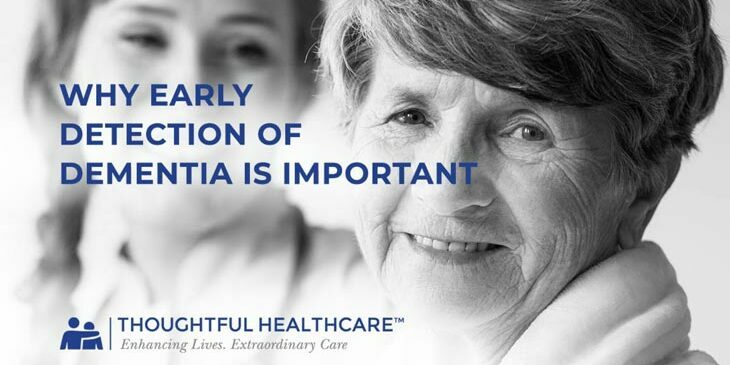 At Thoughtful Health Care, we are in the business of providing in-home care for people with memory issues like Alzheimer’s. Please contact us for more information about the services we provide to families in the Kansas City metro area.